Senate Inquiry: Caring about kids. 1979 – The last time anyone cared about kids, probably. The logo portrays a loving ‘Care for Kids’ attitude noticeably missing since 2008. SO let me share an observation with some fair-dinkum adults who continue to care about kids. Those who care about tests will not be interested. Treehorn is a little boy who represents all those children whom adults don’t care about, i.e. almost 100% of children between 5 and 15 years of age. You know Treehorn. He’s that very green-skinned little boy in front of your nose, appealing to you for help. All school children are this unnoticeable green. If readers gave some thought to the feelings of school kids who have to contest Australia’s NAPLAN and then consider how adults expressed their concern about little kids’ reaction to NAPLAN testing, you might like to check the submissions to the Senate Inquiry and read how concerned a very special cohort of Australians feels about the vomiting, sleepless nights, profuse pre-test crying and great distress that children must suffer at NAPLAN time to satisfy the egos of measurers, testucators, researchers and inquisitors. One would think that the scandal of adults treating young children this way would be a national issue up there with boat people. You would think….. I went through the transcripts of the face-to-face exchanges between three Senators and some specially selected submitters at a public meeting [attendance figures not printed] in Melbourne. I’ll go through the written submissions themselves at another time. There are at least 83 to go through. Any researchers available? Is it proper to force fear and distress on children who are compelled to attend school and forced to do the tests? Isn’t there a moral issue here? Below are extracts from two exchanges that I found . Since young children were used as tools for the collection of hard data [useless, invalid and unreliable] it should have been incumbent on all participants – senators, selected submission invitees and concerned contributors – to comment how each felt about child welfare during the testing processes, shouldn’t there?. You might like to check to see if I missed any other indications of genuine concern for the mental and physical health of kids during the NAPLAN months. Ms Dulfer made a submission of behalf of the University of Melbourne and the Whitlam Institute. Senator BILYK: I think you did some work on stress on students—self-esteem, physical health, fear of freezing, crying, sleeplessness et cetera. Can you tell me through those statistics? Ms Dulfer : We ask teachers to comment on whether they had had any students report any of the following issues,: feeling stressed, concern that they were ‘too dumb’, fear of parents reaction to test scores, feeling sick before the test, the students freezing during the test, sleeplessness or crying. Each of those key areas came out in the research we looked at in the literature review. They were all mentioned in more than one research paper prior to that. Otherwise they would not have been included. Senator BILYK: For the test? Ms Dulfer : On the days of the test, not wanting to go, either absent themselves or their teachers are absenting them. At this stage I am still trying to work on that final data about it looks as though over half of the 1,300 respondents talked about truancy issues. We are talking about all sorts of issues going on. Senator BILYK: That is from teachers? Ms Dulfer : That is from teachers, absolutely. It is a secondary source of data and it is important to remember that. ACTING CHAIR: When you said ‘truancy’, you said it could also be the teachers absenting the student. Ms Dulfer : Sorry—I meant parents absenting the student or the students absenting themselves. Senator BILYK: I just want to play the devil’s advocate a bit here, if I might, regarding those issues about feeling sick and thinking you are dumb. I went to school some time ago, I must admit, but that is how I felt before tests. At times I felt dumb because I could not do something. Is it that unusual? I am not sure whether you were here earlier in the day, but I spoke about the interest I have in the resilience of young people—or, actually, the lack of it these days. Shouldn’t we, in the education system, be preparing our children for the fact that they might not know everything, or that they might feel butterflies in their tummy before a test, but it is quite normal? I am just playing devil’s advocate; I am a bit concerned that there is a whole lot of emphasis put on these things, but I do not know that we are actually dealing with it the right way or that it is being interpreted the right way for it to be dealt with. Rather than say, ‘No more NAPLAN’, shouldn’t we be saying, ‘Okay, it’s quite normal to feel a bit nervy before a test’, or whatever, and teach kids some resilience about it? Ms Dulfer : When we look at the research around anxiety and testing, there are two components to it that start to play out. One is that when students are overly anxious their cognitive ability actually reduces, so they are actually unable to represent themselves properly within the test; they start to do poorly in their own test results. When that starts to happen you often end up with this downward spiral: ‘I’m concerned that I’m dumb, I’ve proven that I’m dumb, oh no’—and down they go. The second thing is that the test has that impact on the student in that the test makes them nervous, makes them anxious. Senator BILYK: Sure, but that is nothing new in tests. Ms Dulfer : No, it is not. And anxiety at a very low level is actually very helpful. We have research that says that some anxiety is very good. However, there is a point at which anxiety tips the balance and has a very negative and very damning effect. Senator BILYK: How do you know from your research if that level has been tipped or not? Ms Dulfer : We don’t, and that is why further research needs to be taken into account. Senator BILYK: So, you are not actually saying, from your research, that the anxiety levels—the issues we have just discussed—are necessarily bad and are necessarily the fault of NAPLAN? It is just that we need to teach kids strategies—which I think we do for their whole life anyway, and I am very concerned that it does not seem to happen anymore—to deal with those? Is it that we need to teach them to deal with negativity, in fact? Ms Dulfer : Yes, we do need to teach kids strategies and so on. But I think I want to look beyond the blame game of, ‘It’s the students’ fault, because they’re getting stressed’ or ‘It’s the teachers’ fault, because they’re putting the stress on to the students’. This stress is coming from somewhere, and it is coming, effectively, from the policy arena. Dr Rice : One of the things we have talked about is that students and teachers are effectively responding to what goes on around NAPLAN and going back to how the results are necessarily used. One of the ways I see a connection here is that when we talk about assessment we talk about formative assessment and summative assessment and so on. It is important that we test students, and it is important that they get feedback. If you are testing a student and they are being provided with feedback immediately that allows them then to build on their learning, then no: they should not be getting stressed about that. Senator BILYK: To me the issue is: is having NAPLAN the cause of this extra anxiety? Is it a case of: it is so stressful that we should not have it? Or is it a case of: yes, sitting a test, if you are in third year, might give you butterflies in your tummy and all, but the way we deal with that needs some working on, maybe, in some schools? Mr Randall : Are you describing how I feel when I sit up here? Senator BILYK: Do you get butterflies in your tummy up there, Mr Randall? Mr Randall : I am not going to say it now! Senator BILYK: I did when I used to sit that side of the table. Senator BILYK: No, and neither am I. It is how we deal with it that is my concern. Mr Randall : but I am questioning, and I will challenge the Whitlam Institute, and I will question even some of the APPA methodology as to how they generalise and draw out from those things, and we could even unpack some of these things. So your point is right: we do have an event—we have NAPLAN there, which says, ‘That is what is going on,’ and it becomes a focus for those things. I will share with you my anecdote, my case study. Do not tell my wife I am sharing this story with you! Senator BILYK: We won’t send her Hansard, then, Mr Randall, and we hope she is not listening! Mr Randall : My year 3 son was more stressed about doing his presentation, speaking in front of his class, then he was about NAPLAN. I cannot generalise from that; it is a little anecdote. Senator BILYK: But how do we deal with that? That is my concern. Mr Randall : Now I will get into trouble! His teacher dealt with it beautifully. I was not there; my wife had to get him out from under the table to get him to school. Teachers, in the main, deal with it beautifully. His teacher worked with him and had a chat to his mum and at the end of the day he came home with a little merit card for being brave and standing up in front of his class. So he worked that through. Senator BILYK: You can read my questions! Mr Randall : Again, we have to bed these things down and work it through the ministerial council and all the others, but you move it online, and then you can broaden the window—I would not go as far as what Norm was saying, in terms of a pause function and all those other things yet, because you have to check out how you want to use this data and so on—but it does not become the focus. The media will be upset with us because there will not be an event that they can focus on on the first Tuesday of May or something like that. We are talking about stretching it over a broader window of time—a couple of children doing the assessment in the morning and another couple doing it in the afternoon, while the rest of the class gets on with things. That is part of the way you can administer it differently. We inherited the NAPLAN from states and territories. It was designed by the ministerial council back in 2006-07. Our view is that we need to learn from some of the things here and, while still being able to achieve the purposes, build upon them. ACTING CHAIR: As you are moving the test online and adapting the administration of it, is a conversation occurring about moving the league tables offline? Mr Randall : My School is not league tables. ACTING CHAIR: Are there any discussions around removing the public dissemination of data, moving the comparative data from schools offline? ACTING CHAIR: So you are discussing it at that level? Mr Randall : If you are asking whether there is discussion around My School within the ACARA Board, the answer is: no, there is not. Around the ministerial council, we had discussion—I would need to go back to the minutes—about what features may and may not be added to My School in the next few years. ACTING CHAIR: Is there any discussion about what features of My School might be taken out? Mr Randall : Not in those forums. Senator BILYK: Getting back to the computer based assessment, we have heard from a number of people that having the NAPLAN test in May but not getting a response until September is causing difficulties. I am wondering what comments you have to make in regard to that. We did hear that a lot today. There is quite a time lag there. One would presume, if things are done online, that there might be a quicker way of doing assessments. Is that correct? Mr Randall : Yes, it is correct. Senator BILYK: Maybe we could look at what time of year NAPLAN is held, or is May set in stone? Mr Randall : Let me answer that in two parts. The first part is that, with moving it online, we are talking about tailored testing, where as young people come on they do the same first third of the items and then, depending on how well they do, they get branched up to more challenging items or down to less challenging items. They do those items and then get branched up again, go back to the middle or go down. So you get a better spread, and you are actually finding out more about what each young person can do. There is a whole range of validity and reliability things that are addressed there. We will need to design it so it is actually marking as children go, so a certain amount will almost be able to be returned straight away. In the current form, it is on a common scale, and we have been able to scale everyone. We are looking at a couple of features, and, again, this is investigative; I will ultimately need to take these things back to the ministerial council. The ministers agree on these things and setting these frameworks. We are working that through with the ACARA Board, and then we will go to the ministers. I have cited some of the features that we want to address. They include: reflecting the curriculum, having tailored testing so that we get a better assessment of what each young person can do and having a shortened period before the data comes back. We will look at whether we can return some of the raw data, and, later on, the scaled data, to schools. We will investigate all those things. We will work with groups like APRA and the states and territories to address those. We will be keeping an eye on the issues that have been aired here today and, as I said at the last Senate estimates, ticking off the sorts of things I think the design of our move to online assessment will be able to address. Senator BILYK: I want to ask about the link between the National Partnership for Literacy and Numeracy and the NAPLAN testing. The department might want to answer the question. Can you talk me through that and what would happen if we did not have the NAPLAN data? Dr Day : The literacy and numeracy national partnership and the Smarter Schools National Partnership, under the low SES communities national partnership, have relied on NAPLAN data to look at how they can improve school performance of young people. There has been significant evidence presented to the department through the state and territory reports about the positive effects of NAPLAN making a difference and teachers becoming assessment literate and using this to change practice. The department is aware of data that indicates that the investment has improved literacy and numeracy outcomes of young people in a majority of the schools in the literacy and numeracy national partnership. It is the same for the low SES national partnership community schools. So, NAPLAN has had the effect of data being used in a sensible and sophisticated manner as an evidence base to drive and lift the performance of students. That is a really positive thing. In the Barkly Region of the Northern Territory—I think we outlined this in our submission—Jingili Primary School have used the data to have an intensive year 6 spelling and grammar program, which has led to other results as well. The Better Schools case studies on the DEEWR website point to a number of those schools, and I will highlight Leichhardt State School in Queensland for senators this afternoon. Earlier today, we heard some interesting comments about how we can extend those students at the top, and Leichhardt State School has done that. They have been able to contract the tail at the bottom end of the standard deviation and also extend the students at the top end. So there are some really positive effects of NAPLAN being used, in a productive sense, in schools under the low SES NP schools. One of the other things is that investment has flowed to some of those schools to improve their literacy and numeracy. Senator BILYK: Some of the submissions have argued that NAPLAN does not test to the higher-order skills. I am interested in your perspective on those comments. Mr Randall : I have said before how we will align NAPLAN to meet the Australian Curriculum. We now have. Before, the basis of NAPLAN was something called the Statements of Learning, which was a document developed and agreed to by states and territories, and that became the reference. The Australian Curriculum involves higher-order skills. We are now doing the work to develop assessment frameworks, which will be used for future NAPLAN, based upon the English and mathematics curriculum and drawing out the literacy and numeracy of that and then taking that forward. I think that by design we will change the nature of it. We are also wanting, through our sample assessment program, to introduce better assessment around what we call our general capabilities—critical and creative thinking, intercultural understanding and a whole range of general capabilities. We will also be working and keeping in touch with some of the work led by Melbourne University through their collaborative problem solving work, which will be a feature of PISA in 2015. So some international work led out of Melbourne University reflects features and lines up with what is in the Australian Curriculum. Having the Australian Curriculum, which is being taught around the country, enables us to use that as a base and, in the mode of assessment I have talked about, to address some of those issues. Senator BILYK: Can you explain to me the sample assessment program. Mr Randall : In addition to the full cohort assessment program, which is NAPLAN—literacy and numeracy—we have sample assessment programs in civics and citizenship, science and ICT on a three-year cycle. ACARA has an undertaking to come back to the ministerial council later this year with proposals about how, on the basis of the Australian Curriculum, that sample assessment program might change and go across a greater range of the curriculum. I note, as I said in answer to an earlier question, that the other thing we need to take account of—with the proposal yet to be resolved and given to us in a direction from the ministerial council—is the discussion at the moment around introducing science into our full cohort testing program. Dr Day : Can I just add that the NAP also comprises international sample assessments as well. Mr Randall has spoken about the domestic assessments, but the NAP also comprises PISA testing, which is sample testing of 15-year-olds across Australia; PIRLS, the Progress in International Reading Literacy Study; and TIMSS, which is the maths and science study at year 4 and year 8. It also includes ICILS, which is the International Computer Information Literacy Study, which will be held this year, I believe. So there are two aspects to the NAP itself—both domestic and international assessments. ACTING CHAIR: So there are a lot more opportunities for anxiety! Senator BILYK: Or for learning to deal with anxiety, in that sometimes we do not all have lovey-dovey, warm feelings in life and maybe we need to know how to deal with those that are not so pleasant. That is my little soapbox speech for the day! ACTING CHAIR: Thank you, Senator! Phil Cullen, No.83 pleading with politicians to Guide Our Nations School Kids Intelligently Let’s REFORM the system for the benefit of kids….NOT FOR ACARA. SCORES. Gonski with NAPLAN attached ?? Think about it. Is it possible? Can ACARA be kept away from children? Phil Cullen AM B.Ed.,A.Ed., Dip.Ed.Admin, M.Ed..Admin[Hons]. FACE, FACEL, FQIEL, Gold Medal ACEL. ‘The Treehorn Express is a tribute to those children who are forced to encounter Standardised Blanket Testing in GERM countries and are forced to suffer from the distress, a narrowed curriculum and loss of progressive cognitive development. Like little Treehorn, they are wonderful young citizens, ignored by those who are expected to care and exploited by those who don’t. Treehorn is that little fellow with the bright green skin, just under your nose, appealing to you to take notice of him. The report by the Senate Committee of Inquiry is out, celebrating the genesis of NAPLAN. The earth has shaken; and kids are anxious in their hope of freedom from fear at school. Its status is now one of Interim Report. Former State Director of Primary Education, Queensland. What is the Badass Teacher Association? Our mission: Badass Teachers Association was created to give voice to every teacher who refuses to be blamed for the failure of our society to erase poverty and inequality through education. BAT members refuse to accept assessments, tests and evaluations created and imposed by corporate driven entities that have contempt for authentic teaching and learning. Our goals: BATs aim to reduce or eliminate the use of high stakes testing, increase teacher autonomy in the classroom and work to include teacher and family voices in legislative decision-making processes that affect students. Group guidelines: We are a rich and diverse group of education professionals and concerned citizens/families who strive to engage in discourse that improves our profession. We encourage dialogue about many hot-button issues but page administrators reserve the right to delete comments, threads, and (if necessary) individuals from the group that do not engage in respectful civil discourse. Decisions to remove comments, threads or individuals are not taken lightly. All potential removals are subject to review by group founders. Examples of offensive remarks/comments fall under but are not limited to: homophobic or racist comments, personal agendas (i.e.- seeking to profit off of published books or merchandise), bullying, excessive or inappropriate use of vulgarity, or comments that conflict with the established mission or goals of BAT. Actions: BAT will engage in organized group actions such as phone calls, emails, or letter writing. These actions will be announced as timely as possible so it will allow all members an opportunity to be a part of the action. We hope that conversations about changing the name no longer continue. To that end, page administrators have been asked to end or delete any comments and/or threads where this becomes the topic. Our intention is to promote the goals of the group and move forward with our efforts. Thank you for your voice and your efforts- and welcome to being a Badass Teacher! Join this rapidly growing Facebook group of teachers saying enough is enough! I welcome suggested articles, so if you come across a gem, email it to me at allan.alach@ihug.co.nz. How does your school define success? How do you? How do the kids? Tony Gurr has the answers. This article by Bruce Hammonds, from way back in 2006 when the light of the developing New Zealand Curriculum document was beginning to illuminate primary school education (in comparison to the educational dark ages that we are presently enduring) looks at Seymour Sarason’s book ‘The Predictable Failure of School Reform.’ Published in 1993, this book proves that our politicians are learning failures. One of the corporate dreams is that education can be provided via online tuition, thus cutting out the middlemen (teachers) and also to increase their profit streams. The usual players (Murdoch, Pearson Group, McGraw Hill, for example) are already working on this in the USA and most likely in Australia and New Zealand – have NZ schools wondered why there has been so much emphasis on ensuring all schools have access to ultra fast broadband? Just a thought…. The Senate Inquiry into NAPLAN is due to produce its report on 27 June, 2013. That makes it a neat 5 years since NAPLAN started its wilfully destructive path. It was on this fateful day, 27 June, 2008 that Julia Gillard, then the federal Minister for Education and Deputy Prime Minister was visiting Washington with a representative [unknown] of the Department of Education to attend the 16th annual Australian-American Leadership Dialogue [AALD]; and they attended a Carnegie Corporation function where they met the redoubtable Joel Klein, then Chancellor of the New York City Board of Education. His self-promoted fame spread; and Julia, following this ‘chance’ meeting at the Washington knees-up, became a devotee. A master pedlar of testing material as a school administrator, his style suited Rupert Murdoch down to the ground. Rupert was already running a cut-throat business based on the pretence of a ‘reform’ agenda that was worth billions of dollars through his publication of tests and allied material; with the promise of online testing soon to control everyman’s schooling. When his newspaper sales later started to sag, his testing companies were able to subsidise their recovery from the huge income from Standardised Blanket Testing. Our befuddled Julia was conned into believing that the testing industry, now feeding from the profits that the sort of Joel Klein system of schooling offered, had something to do with learning in the classroom. Joel Klein is now a Senior Executive of News Limited. Australia lives with his legacy. How did this happen to us? Julia was so impressed by his spin that she invited him to Australia. She was then in a long line of federal education ministers who could not tell a learning-based classroom from a flung sandwich…..Kemp, Bishop, Nelson amongst them. They suffered from the same malady that infects the world every now and then. When such peculiar memes spread around the globe as fast as torn jeans and tattoos, we teachers know that creative, purposeful learning suffers. There are some people who just love bashing schools about without evidence of any substantial nature. Politicians are usually the amongst the most critical and lead the assault. Do you vote for any such mischief-makers? 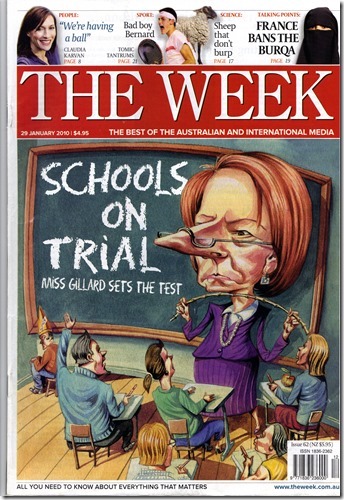 In early 2007, Julie Bishop, the federal minister for education lamented declining education standards at the same time as a book called Dumbing Down by a Dr. Donnelly, the self-described ‘thinking man’s Andrew Bolt’, was launched. Dr. D had been chief of staff to Kevin Andrews. Fascinating how memes spread, isn’t it? This time, in Australia, a one-man black paper. Last time, some pommy academic malcontents’ ‘Black Papers’! Julie Bishop followed the best whinging traditions of Messrs. Brendan Nelson and David Kemp. The tradition has been maintained and it looks like being maintained by Chris Pyne. He’s part of the red-neck testucating brigade, hiding his cards ready for a ‘robust’ attack on schools. When will it stop? Our children’s cognitive development will have to maintain a stet position and suffer more, unless something is done real soon. Who is thinking of the kids? Gillard was true to her leader of course, who, upon his appointment as PM, had become really forthright about the need for accountability in regard to standards. His ‘Revolution’ was based on comparison of scores between schools and, if children did not score well at one school, they could ‘…walk with their feet to a better performing school.’ Whatever! Gillard knew what her friend and leader meant. He left that action to Julia. She’s good at it. That’s how Australia got lumbered with the Klein system. When Julia took over PMship from Kevin, it was a done deal. She had decided. No reference to anyone who knows how classrooms work. Her Klein-based fear system, described as a joke by the normless and supported by the gormless, needs to become a ‘dead, buried and cremated’ monument to stupidity, if democracy in Australia is to be regained. NOW! Not next week. We are stuck with this evil, unethical, immoral, expensive, unnecessary evil unless the Senate Committee of Inquiry strongly suggests that NAPLAN and any other forms of Standardised Blanket Testing be banned forthwith. An adjunct to this decision should be a proposal to establish an Integrity Commission, headed by parents and teachers – no measurers anywhere – to examine expensive government-led ‘revolutions’ of any kind. Surely, the Auditor-general’s report that the $540million – Yes – $540million dollars spent on NAPLAN, “as yet to make any statistically significant improvement in any state…” is reason enough to ban the financial monster..
At this stage – a few days before the publication of a report that could make a huge difference to the future of Australia – do you feel confident? I shouldn’t….but I do feel that the party line will prevail in each of the committee members. I have trouble imagining that there is any genuine concern for kids at school amongst our political representatives and that they will come before party ‘loyalty’. Dear God. Prove me wrong. Have you ever heard of any noises from the party rooms about NAPLAN over the past 5 years? Have you heard of any one or groups of members insisting that ‘Ban NAPLAN’ become part of party policy? Have you seen any tax-payer paid full-page adverts in any of the dailies, screaming “Ban NAPLAN. Think of our children” sort of thing? The Courier Mail reported on Friday 22/06/13 that, in their submission to the Inquiry, Queensland principals complained about the excessive crying in schools, the pressure that NAPLAN imposes on teachers, the side-lining of important curriculum subjects during the lengthy preparation period, the enormous pressure that parents are imposing on children [this also from Q’d P&Cs]. The Catholic Education Commission was concerned about Year 3 anxiety during the testing period. What’s going on? Both organisations could stop the nonsense tomorrow. Either could say NO en bloc. Campbell Newman would approve. By allowing this sort of turmoil to be imposed on the children who are attending their schools, shouldn’t professional ethics come into play? Clearly, NAPLAN is a nasty, nasty business. It’s been five l o n g years, kids. In summary….. The way that Australian school systems and represenatives treat their children is bewildering. How can Gonski reforms operate while NAPLAN infects the system? Please explain! If the Senate Inquiry Report doesn’t recommend the closure of the factory , what will our children’s carers do? What will our school children do? Where are their parents? that, according to Klein [Dec.2012] , the education testing lobby is worth about $US700billion to his company, Amplify….. providing digital products and services? that Mr. Murdoch was described as ‘not a fit and proper person to lead a world corporation’ in a British Parliamentary report? Career includes 25 years as teacher and principal, Department of Education official, senior manager of ERO, establishment CEO of NZQA and consultant since 1996 – working on range of projects with schools, industry, MoE, Te Wananga o Aotearoa. Author of Our Secondary Schools Don’t Work Anymore .Currently on establishment Board of Tai Wananga, a new model multi-site secondary school. What is the purpose of schooling in this complex and rapidly changing world? What are the understandings, skills, attitudes and values [or dispositions] our young people need to develop if they are to successfully face the challenges of their futures, and to contribute as productive members of our society and economy? What does this mean in terms of curriculum, teaching and learning, and assessment? How will we know when we are successful? To answer these questions we need to have an understanding of history. Universal schooling was a response to the emerging mass manufacturing economy of the early part of the 20th century. Its design is now universally described as the factory model because in design and process it reflected the characteristics of the assembly line. Children entered the production line in batches by age and at various points ‘quality checks’ applied to test their educability. Selection was its over-riding objective; its purpose to progressively sift out the 12-15% who would become the professionals, administrators and managers, the decision makers for industrial society. At different points on the production line were the ‘purchasers’ choosing different grades of product suitable for their purposes. At the very end of the line, accepting the surviving 12-15% with the highest grade, were the universities. Justification for this selective function lay in the beliefs that intelligence is fixed at birth, is innate, and can be measured in precise numbers. The overt curriculum was reading, writing and arithmetic; the covert curriculum was punctuality, repetition and discipline. Thus the majority were prepared to be passive, obedient workers in the factory and other workplaces. While schooling now offers a plethora of subjects, and in spite of numerous ‘reforms’ at high cost to the taxpayer, the key characteristics of the factory model remain. We still have an obsession with trying to measure learning and schooling still grades, sifts and sorts students by seeking to attach numbers to them that are limited measures of a limited range of abilities. Is this what we really want out of our education system? We live in a world very different from 100 years ago. There has been in a revolution in our understanding of the nature of intelligence; it is complex, and more than just IQ. We are also much clearer in our understanding of how the brain works and how children learn best. Knowledge is no longer seen as individual, fixed, passive and a matter of facts to be regurgitated, but active and constantly evolving. The emphasis is on creating and sharing and utilising new knowledge, and problem-solving and creativity require multi-disciplinary approaches. The workplace is totally different; employees need a much broader range of skills. Over the past decade the biggest employment gains are in occupations that rely on people skills and emotional intelligence, imagination and creativity. Recognition that the current model cannot meet the needs of all students and cannot resolve the issue of the continuing under-achievement of particular groups. Every child will be a future parent, voter, citizen, member of the community [local, national and increasingly global] and a worker. The emphasis of the current system is on the last, in the false belief that delivering education in this way, through standardisation and a focus on ‘academic’ learning New Zealand will be assured of a bright economic future. There is however little correlation between a country’s economic performance and creativity and technological innovation, and national testing, and how many external exams and school qualifications it has in the last three years of secondary schooling, or with the international PISA results [which seem to be the basis of the oft repeated claim that “New Zealand has one of the best education systems in the world”]. On other international indicators New Zealand doesn’t rate anywhere near as highly e.g. child and alcohol and drug abuse, youth suicide and incarceration rates, the poverty gap. These ‘outcomes’ seem to be a clear indication there is something wrong with our education system. Along with those major issues the world faces such as climate change, the environment and rapid depletion of the earth’s resources, we seem to be leaving it to our children to find answers to all of these problems because of our continuing reluctance and apparent inability to deal with them. To find solutions will require an education system that produces young people who understand themselves and others, and the world in which they live; are tolerant and compassionate; and lateral, creative, innovative and ‘connected’ thinkers. 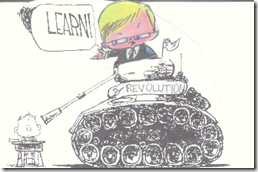 New models of schooling are emerging in many different countries including here in New Zealand. All of them share common philosophies and challenge conventional practice; they also show that poverty and ethnicity do not have to be barriers to success in learning. This means a strong focus on every student as an individual, their individual strengths, interests, passions and aspirations, and the nurturing of their mental, physical, social/emotional and cultural/spiritual capabilities [see Covey]. It also means high expectations for every student, a focus on quality work and students applying effort and perseverance. The curriculum of these schools is designed to provide rich and varied contexts for students to acquire, develop and apply a broad range of knowledge, understanding and skills; to enable them to think creatively and critically, to solve problems and to make a difference for the better; to give them the opportunity to become creative, innovative, enterprising and capable of leadership to equip them for their future lives as workers and citizens; to enable them to respond positively to opportunities, challenges and responsibilities, and to manage risk and cope with change and adversity. Some of these new kinds of schools monitor their students for up to 12 years after graduation; they recognise that what students achieve after school is probably a better measure of the value of their schooling than what they did in school. What does it mean to be literate in a networked, connected world? What do students need to know and be able to do to be successful in their futures lives? We need to do that rather than continue to tinker with a model that increasingly is seen to be irrelevant, that is itself largely meaningless, and obsolete for today’s world. Lorraine’s submission to the Senate Inquiry, below, needs to be read by all teachers who are concerned about the treatment of teaching literacy at school and how it is regarded and handled by NAPLAN measurers. Her attachments should not be ignored either. This is a powerful, thought-provoking article. It’s No 11. I write as an experienced educator with expertise in language and literacy curriculum. I consider the literacy tests to be totally invalid for today’s children. The type of literacy able to be measured by multiple choice, machine marked tests, is low level literacy. It is the type of literacy we taught in the 1950’s, 1960’s in Australia. Since that time there has been much excellent research which has illuminated the types of reading and writing necessary for a changing, global, highly technological society, as well as research about how children learn language (both oral and written). I take time here to briefly describe some research of recent decades which has changed dramatically what we know about the teaching of reading, and writing in schools. Reader as code breaker: the reader starts off outside a text and uses different strategies to get inside that text. Reader as text user: the reader uses texts as he negotiates life each day in the big wide world, of the 21st century. It is not enough that students read with understanding in school classrooms, they have to experience texts which relate to their life purposes, or else they will not read outside the classroom. Children must know and experience texts which relate to and inform about, their life interests and purposes. Reader as text analyst: the reader steps back out of a text and identifies the author values. What is this author’s underlying message? What bias or stereotypes are evident in the author’s writing? Which position on this issue is the author ignoring? Whose voice is silent? The text analyst practice (critical literacy) is so important today with the control of the world’s mass media belonging to fewer and fewer individuals, and, simultaneously with the world wide web, any individual can now send information around the word within a matter of seconds. How does one determine the veracity of such information? The reason I am describing this model of reading, respected by literacy educators all around the world, is because we know that reading is much more than getting words right, or, being able to find right answers to literal comprehension questions, as the majority of NAPLAN reading questions require. Today’s children are wasting time, learning to colour in bubbles, as required on the multiple choice test papers, learning how to find specific right answers to some unknown person’s questions – and never given opportunity to ask their own questions. Such practices are dumbing down the reading curriculum; are dumbing down children’s lives. The research of Kenneth Goodman in which he identified what became known as ‘the reading process’, describes what a reader does to get inside a text and to make meaning. Until this research, it was believed that reading was a visual process; that it was important when reading, to name each word in the text, correctly. In Goodman’s very extensive research, running records were made of children’s oral reading. As the child read the text aloud from a book, the researcher, on a copy of the text, ticked the words named correctly by the child, and noted all oral reading errors, or, miscues. These miscues included words repeated, left out, or added to the text. At the end of each reading, the child was asked to do a re-telling of the text. The re-telling was taped. What this research showed was that the quality of the child’s understanding as revealed in the re-telling was not automatically linked to the number of oral reading errors. Rather a good re-telling was linked to the type of miscues, not the quantity. Some children’s miscues revealed their focus was getting each word right, and so their reading errors looked like the word in the text, (visual miscues), but made no sense. What was very worrying was that these readers did not stop and re-read, when what they read did not make sense. Their purpose in reading was getting words right, rather than putting the language together to make meaning. TEXT: I heard the dog bark. TEXT: Once upon a time there were three little pigs. Goodman’s research highlighted what code breakers do, in their efforts to get inside and make meaning of a text. They take a visual sampling of the text and allow the brain to predict the text drawing upon syntactic and semantic knowledge . When the reader’s predictions do not make sense, that reader stops and re-reads or reads on, in an endeavour to connect with the ideas of the author. In a formal, silent, reading test situation, one cannot listen to a struggling reader read aloud, to determine, if he believes reading is a purely word centred activity where he must name each word correctly. That is, the NAPLAN test cannot evaluate the code breaking strategies, or reading process being observed by the reader. How much easier it will be for a child who has multiple experiences of earthworms, perhaps helping Dad with a worm farm in the back yard, to read this factual text and to answer the test questions. These children will have much life experiential information to use to help predict the text and to answer the test questions. Think of other eight year old students. Think of the ones living in the high rise housing commission flats in North Melbourne. Some years ago the then local school principal decided to dig up some of the school yard asphalt to start a vegetable garden. His students from the flats were absolutely amazed that there was dirt under the asphalt. They had never seen loose earth. They thought the asphalt was a natural phenomenon. They did not realise it was put there by man. What experiences would these children have of earth worms? What pre-existing knowledge would they have to bring to this text? c) SPEED READING The children who answer most questions in the NAPLAN Reading tests have the best chance of gaining the highest scores. Children soon learn that rather than reading the test article first, it saves time to read the questions first and then quickly skim the text to find the literal answer. This is low level reading. It is not about bringing meaning to text; it is not about making use of a text; it is certainly not reading as text analyst to identify author values. It is measuring nothing of value. Speed reading to find specific right answers, serves no authentic life purpose. It tells us nothing of value about a child’s reading. It does not inform whether the child reflects upon a text to clarify meaning, whether the child makes connections between the text and his life, whether in fact there are any connections in the child’s life upon which he can draw, or whether, the child reader identifies cultural bias in a text. NAPLAN is promoted as being diagnostic. It most certainly is not. Reading as described by the Luke/Freebody Model, by the work of Ken Goodman, and by the research of many other linguists, is in no way compatible with the model of reading upon which the NAPLAN test is based. The NAPLAN Reading test cannot measure a child’s reading ability nor identify where assistance is needed. NAPLAN spelling is assessed in two ways. A misspelt word presented in a sentence, is circled. The child has to write the error again, correcting the spelling. A misspelt word is presented in a sentence, but not circled. The child has two tasks here. Firstly, identify the misspelt word, then, write it correctly. For some strange reason each of these types of test questions is worth one mark. That is, in b) above, a child is given no credit for being able to find the un-circled misspelling. Of more importance though is the fact that the learning of spelling includes both the production of correct spelling, as a writer is writing, and recognition of errors, by proof reading for misspelt words. In the NAPLAN Language Conventions Tests, a child’s ability to generate correct spelling is not assessed. As a method of testing a child’s spelling ability, both the NAPLAN strategies are questionable. Each strategy used in the test includes misspelt words. These misspellings can impact on how the child then spells the word. Misspellings may introduce incorrect letters which the child might never have included in his production of the spelling, but seeing it in the test question, causes confusion. A research study by Willet and Gardiner (2010) in which they compared student NAPLAN results, with these same spelling items being tested via oral dictation, found that an astounding 75% of children had improved spelling scores. They suggest the NAPLAN spelling scores are misleading. Literacy educator Di Snowball has analysed the ACARA reasons for the inclusion of each particular spelling item in the NAPLAN Language Convention Tests. She has found that every single analysis is incorrect. I include just two of her examples. What is important in the teaching of spelling is a child’s knowledge about, and application of, a wide range of spelling strategies. Children should be able to discuss the strategies they have used in words they have spelt. Where one strategy fails, they have others in their repertoire to try. Spelling strategies play no part in NAPLAN spelling, further evidence that NAPLAN is not diagnostic. The 2013 writing assessment involved all Grade 3 and Grade 5 children writing to the given topic ‘Hero Award’. See copy below. Just think – all grade 3 and grade 5 children across Australia, writing to the very same topic. How unfair that is. What is this writing activity measuring? It is measuring the child’s ability to read with understanding and follow, the suggested out line for writing a persuasive piece. A child may have no knowledge of how to write a persuasive text, but in this test, a complete structure is printed there for the child to follow. I repeat, What is this measuring? During the 1980’s, an American researcher Donald Graves revolutionised the teaching of writing in primary classrooms. Up until this time, teachers always chose the class writing topics. The children were expected to get the ‘composition’ right in one draft. The only audience for the writing was the classroom teacher. 2013 NAPLAN Writing task, Yr 3 & 5 sympathetic friends as a way of getting helpful feedback, and, often their writing is published. Graves outlined what has become known in schools as ‘The Writing Process’. Schools across Australia adopted the Writing Process, with children of all ages selecting their own topics, conferencing their drafts with their teachers, re-drafting when necessary, taking some drafts through to publication. Thus classroom libraries came to include many attractive books written by the students. Allowing children to choose their own topics, helped value the children’s lives. They were free to write about their families, their worries, their interests, not just the tired old topics of their classroom teachers. Children could bring their lives into their classrooms. Sadly the NAPLAN testing has meant much, much less writing of this type is occurring. For three years now the NAPLAN writing test has required a persuasive piece. Every classroom one now visits, one sees evidence of persuasive writing. The children are so sick of it. Many schools have stopped allowing children to choose their own topics, and to choose their own audiences. Classroom publishing by the children has virtually ceased. NAPLAN writing has decimated what were once exciting writing classrooms. Writing now in many classrooms has returned to writing compositions as in the 1950’s, 1960’s. The class writes to the teacher’s topic. Children have one draft to get the piece ‘right’. Such has been the impact of NAPLAN. This Inquiry asks what impact NAPLAN is having on teaching and learning practices. I have made reference to the outdated literacy practices valued in the NAPLAN tests. Since 2008, children in classrooms are experiencing teaching and learning practices which embarrass professional educators. Outstanding classroom teachers are now required to do things in the name of teaching which they know, are in direct conflict with best practice. They hate being put in this position. As a very experienced educator I cringe when I see these pages. Our teachers are treated as puppets, not able to think for themselves; as automatons, programmed as to how and what to say. Which other group of professionals would allow themselves to be treated like this? Our children, as young as 8 years, are seen as empty vessels with authoritarian adults pouring in information – reading out instruction after instruction. There is a limit to how many orders any one person can remember at any one time. This empty vessel notion of learning is so old. We know that children must be active in learning. We sit them in groups in their classrooms today, so they can talk together and learn from one another. How can we justify this unwarranted cruel, authoritarian, unprofessional treatment of both students and teachers? The tone and content of these notes epitomise all that NAPLAN represents– a centrally determined, authoritarian manoeuvre to gain some political end, at huge expense to the tax payer. NAPLAN has nothing whatsoever to do with improving educational opportunities for all Australian children. How can the federal Government testing of students be improved? No-one would debate the right of Australian Governments to collect data re education, as education is largely funded with tax payer money. However such data should relate to comparisons of different populations across the country eg indigenous students versus non-indigenous; rural v city; different starting ages. Such data need only be collected every three years, certainly not every year, and to collect such statistical information, it is not be necessary to test every child. A random sample is sufficient. For such data to benefit the learning of the different student populations across the country, the methods of collection need be compatible with modern insights into how children learn, and, they should assess language and literacy relevant to today’s society. Importantly, experienced, knowledgeable educators need to be involved in the development of any such data collection initiatives. The NAPLAN Reading, Writing and Language Convention Tests are a terrible mismatch with today’s best classroom practice. Children commence school at many different points along the language learning continuum. What they know about reading and writing on school entry is more a measure of their pre- school literacy experiences than of their intelligence. Curriculum begins with what the children know, not some mythical Prep or Grade 3 standard. It is the teacher’s job to find out what each child knows, what his interests are, and to teach from there. It is grossly unfair and anti-educational to set the same expectations for all children of the one age. Education does not follow the same narrow path for all children. However, in Australian schools all across the country, that is the impact of NAPLAN. Children’s cultures, children’s local knowledge, children’s individual interests are trashed and discarded by NAPLAN. For any school to do well as judged by NAPLAN, that school must have standardised students. Classrooms should be places of joy and discovery. NAPLAN is sucking the life blood from our teachers and students. Schools are no longer places of joy. I have worked for five decades in Victorian primary schools. I have never seen morale as low as it is at this point. I have never seen the teachers as dispirited as they are now. Bartlett,B. & Buchanan, J. 2012, “Exploring NAPLAN Spelling Data” in, Say NO to NAPLAN Papers, Nos 1-10. See Literacy Educators Coalition website. Kohn, A. 2011, Feel-Bad Education, Beacon Press, Boston. Luke,A. & Freebody,P. 1999. “A Map of Possible Practices. Further Notes on the Four resources Model.” In Practically Primary 4 (3):39. Snowball,D. 2012, 2013, NAPLAN Language Conventions, Spelling Charts. Willett, L. & Gardiner, A. 2009, “Testing Spelling – Exploring NAPLAN”, paper presented at the A L E A Annual Conference, Melbourne. Wilson, L. 2002, Reading to Live: How to Teach Reading for Today’s World, Heinemann, NH, 45.
that the Report of the Senate Inquiry into NAPLAN is to be released on this Thursday, 17 June, the birthday of NAPLAN’s ORIGIN? It IS Origin Week after all. Hopefully, it’s GOODBYE NAPLAN DAY. It was on 27 June 2008 that Julia met Joel [Klein]….one of the saddest days in Australia’s history. They met at a Carnegie Corporation function in the USA. Corporation? More to come in The Treehorn Express later in the week. Former State Director of Primary Education,Queensland.